Please note that the title of this post is not: “how to pack light for study abroad.” I am not a light packer, and likely won’t ever be. So if you’re looking for advice on how to travel Europe for three months out of a carry-on, this is not the place for you. However, if you’re like me and enjoy having a variety of clothing and accessories to wear while you’re traveling, keep reading. I’m actually going to split this post into two parts, the first being what exactly I’m bringing and the second being how to make all of it fit into two suitcases. And when I come home I plan on doing another post to revise this one and let you know what I ended up not needing and any essentials I failed to bring along. I’m going to Oxford in the winter heading into spring, so the biggest thing for me has been packing warm clothes and items that can be layered. I started my packing list back in November (clearly I like to plan ahead), and that’s given me time to narrow down what exactly I want to bring. As soon as I came home for the holidays, I started stacking all of the clothes I’m bringing on the desk and chaise lounge in my bedroom – once you see everything you’re planning on bringing, it’s really easy to take things away that you don’t actually need. I’ve often heard people suggest not bringing any toiletries and buying all of them when you get to your destination country. However, as someone with somewhat expensive taste in beauty products, I’m not trying to re-purchase all of my products when I get over there. So I’m reserving space in my bag for my toiletries – it’s all a matter of what you prioritize. If you think you can buy everything when you get over there, by all means, do that. I’m also bringing most of the non-clothing items you’d expect: school supplies, makeup, sunglasses, an umbrella, my laptop/camera/phone/etc., and a few books. I’ve also packed a blanket, and I’ll be buying towels when I get over there. I’ve also printed out a few pretty quotes and watercolor prints that I like so that I can dress up my sleeping area a little bit (my thought is, if I’m going to be staying somewhere for 3 months, I might as well make it cute). Luggage-wise, I’m checking two suitcases. I’m using a weekender bag as my carry-on, and I plan on using it for all my weekend trips once I’m over there because it’s so easy to carry around. 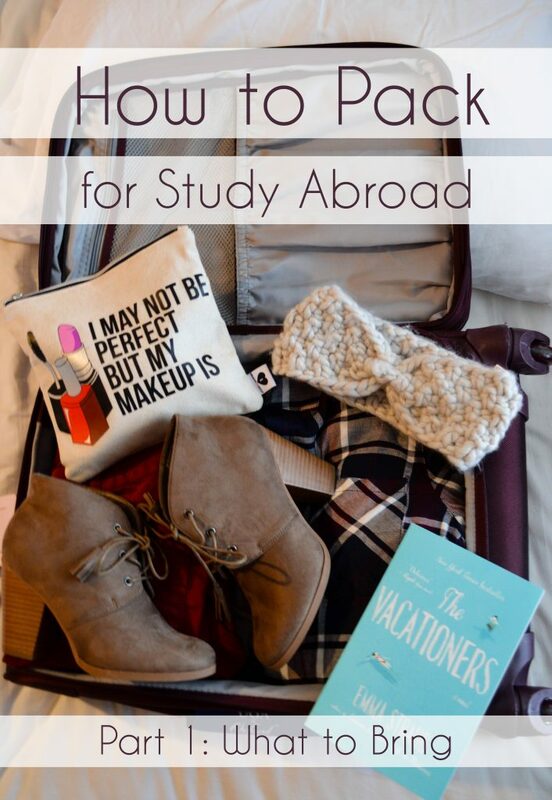 If you have any tips for what to bring on a study abroad trip, make sure to let me know in the comments!